How to Price Your Foreclosure Jobs to Make the Most Profit -- Every Time! Learn how to price foreclosure cleaning jobs using definitive formulas that help you win more bids -- and make more money! This ebook is a companion to the best-selling, How to Start a Foreclosure Cleanup Business. It tells you everything you need to know to successfully price jobs to make the most money in this industry. Whether you are a seasoned business professional or a new business owner, the pricing guidelines outlined within will ensure that you price jobs – for profit – every time. Actual pricing scenarios are given, as well as a detailed chart outlining what we call the “money trail” of this business. That is, what happens from the minute a house goes into foreclosure until it is sold again. We tell you who handles what, how they get paid, how they subcontract, how to price your services based on who is giving you work and more. No other pricing guide gives this type of in-depth detail that is critical to pricing jobs right in this industry. Knowing who you’re dealing with is crucial to pricing right. With the inside info you’ll only find here, you’ll be able to outbid the competition – and win contracts from the “big guys” in this industry. All because you know who they are and how the money flows. Following is a detailed Table of Contents. This pricing guide was written to give new, smaller foreclosure cleanup business owners a better handle on pricing their jobs “for profit.” Read that again: FOR PROFIT. Pricing for profit is not hard; but it is somewhat of an art. If you don’t have pricing guidelines for your business to follow, your business will be open, and you will be busy as a bee, phone ringing off the hook, running all over the place, but you won’t be making a dime in profit. A foreclosure cleanup company does everything from maintaining lawns, securing windows and doors, and changing locks, to painting, inspections, minor repairs, tarping roofs — and much more. As a new foreclosure cleanup business owner, you can determine which services you want to offer and plan to grow your business as fast or as slow as you choose. We teach you how to take several factors into consideration before blurting out prices. We say “blurting out prices” because that’s what many of your potential customers will want you to do. However, one thing you don’t have too much control over in this business really is the pricing — “if” you’re pricing to make a profit and keep your doors open for a long time. This guide was written to help you do just that. While you can think of this as a “quick-reference small business pricing tutorial”, keep in mind that entire books are dedicated to this one subject. We cut through the financial speak to give you the knowledge you need to price your foreclosure cleaning jobs just right. While there are many ways to price goods and services, they basically fall within the three categories we’re going to discuss here though. Understanding this will make it so much easier to figure out how to price, because it gives you concrete models upon which to base your numbers. The three major methods used to price goods and services are: (i) by cost; (ii) by competition; and (iii) by market perception. We discuss each in detail and give you a pricing formula for each as well. Once you are equipped with the knowledge of what HUD will pay for a service, you can better set your prices. But you must first determine where you are on the totem pole in getting paid. No worries – in a later chapter, we break it down for you in an easy-to-understand flowchart where you, the smaller foreclosure cleanup company, fall in getting paid. HUD is a big organization, the granddaddy of them all. They have management, marketing and maintenance arms working for them to ensure their properties are taken care of to certain specifications and within budget. Your company may be a subcontractor at the bottom of the list, but your profit margin will certainly be affected by HUD’s guidelines. HUD’s pricing caps change periodically, so we’ve started with the latest pricing caps provided. Their pricing chart is a jewel when it comes to deciding how to price your smaller company’s services. We give it to you, as well as tell you how to perform jobs to HUD specifications. This type of detailed knowledge will set you apart from the competition – and help you to win more bids. An Excerpt the services your company can offer run the gamut. But for our purposes in this pricing guide’s chapter, we will explain in detail what is expected when you perform specific property maintenance and repair services outlined by HUD that may trickle down to your smaller foreclosure cleanup company in the form of subcontracting work via the M&Ms. Below are some of the main, specifically, property maintenance and repair services, for which HUD uses M&Ms. Some services examined in detail include property inspections, changing locks, boarding windows and doors, debris removal, yard maintenance, snow removal and more. There may be several middlemen between your company and the pricing caps discussed in this chapter. When you consider putting in bids on jobs and you feel you can’t do the job correctly within the parameters below, you may not want to bid on that particular job. The prices below reflect what the larger companies are most likely getting paid. You will be a sub, remember, and may have a sub or two before you, which means these figures are trimmed down even more. A state-by-state chart of what HUD pays for various property maintenance services listed. Invaluable for figuring out how to price jobs competitively! Now that we see HUD’s pricing caps, let’s take a look at how other companies providing foreclosure cleanup services charge and the pricing mechanisms they use, not taking HUD into account. Some of your clients will be direct pays: homeowners who have bought a foreclosure, investors who have picked up a few foreclosure clients, etc. Following are the some concrete guidelines you can you use to price everything from carpet laying and removal to painting to general trashouts and debris removal. Let’s get specific . . .
We give you specific details on how to price trashouts and debris removal jobs, painting jobs, carpet removal, laying and padding jobs, move-in/move out cleaning jobs and a host of other services (eg, tree trimming, gutter cleaning, etc.). There are several schools of thought on foreclosure cleanup pricing. Below are some soft factors that should be considered before doling out hard and fast numbers in foreclosure cleanup estimates. 1. What is someone in the subject county, city or zip code willing and able to pay for a foreclosure cleanup services? Clients in a metropolis like Chicago will expect to pay more than someone in a smaller city like Selma, Alabama. New companies should call other companies to see what they charge for services. Listed are several more of the “soft factors” to consider when pricing so that you don’t get burned – and you will if you don’t consider these because they are every bit as important as direct, hard costs (eg, equipment rental). Pricing can determined based on a number of factors and using a number of methods. Only you can determine which method will work best for your company. Below we list some hypothetical scenarios to help you determine what to consider when pricing. If you get a call for a small trashout of a 3 bedroom, 1.5 bath home that you know you can handle yourself, alone, with your existing truck (BECAUSE YOU WILL HAVE SEEN THE PROPERTY! ), and you know you will get paid immediately upon completion of the job, you should price the job lower than if you were hiring a couple of laborers and waiting 60-90 days to get paid. Again, we go on to list several more of the “soft factors” to consider when pricing so that you don’t get burned – and you will if you don’t consider these because they are every bit as important as direct, hard costs (eg, equipment rental). Following are some links to helpful organizations that can help you grow your foreclosure cleaning business. SBA.gov: This is the national website for the Small Business Administration. If you need help crafting a small business plan, marketing, financing, mentorship, etc., this is THE organization to go to. FYI, one of the most valuable programs the SBA offers is SCORE. This is the acronym for the Service Corp of Retired Executives. These are retired business officials – from every sector – who volunteer their time to help aspiring entrepreneurs. It’s literally like hiring a business consultant. These cost hundreds of dollars – per hour – on the low end. But, you get all of their years of business experience – for free. Also listed are organizations where you can apply to be vendors of larger foreclosure cleaning companies (ie, to get foreclosure cleaning contracts, where to find foreclosure realtors and more). 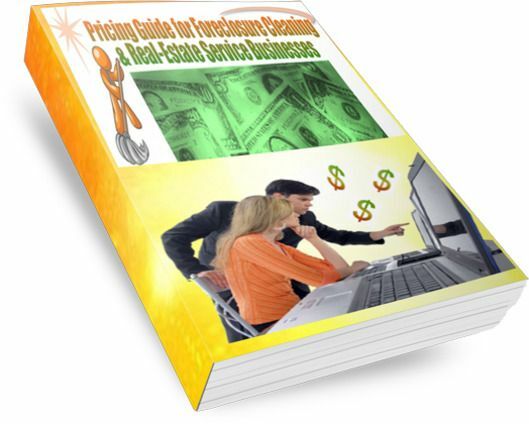 This ebook is 129 pages of the most in-depth information you will find on how to price foreclosure cleaning – and other real estate related services – jobs. You’ll never worry about pricing jobs correctly with this guide. The information within will help you price competitively so that you win more jobs – no matter who is giving them to you (eg, a realtor, a bank, an investor or a primary homeowner).